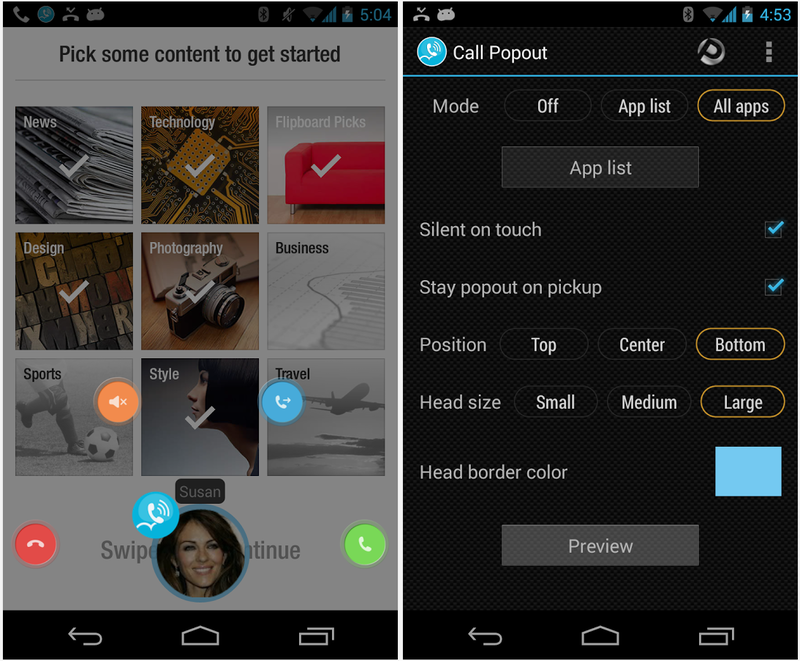 Root Uninstaller, the developement team that brought you such apps as Root Uninstaller for Android as well as many others, has launched Call PopOut, an app that displays incoming calls with a pop-out bubble, a bit like Facebook Chat Heads. If taking that call right now is inconvenient, but it’s equally pretty hard to ignore because the incoming call alert is dominating your entire screen, it might be worth checking out Call PopOut. The system allows users to specify individual apps to use its pop-up incoming call alerts (above left) to prevent users being overly disturbed, or you can specify to use it for all incoming calls. If you find it gets too annoying in itself, you can always disable it. There are also other options available, like the ability to silence the call, and you can specify exactly where on the screen you’d like the pop-up to appear. It’s a simple system, and one that looks to take inspiration from Chat Heads, but if you’ve been looking for something similar for phone calls, this might be it.